I'm participating again in Spoonflower's fabric design contest. It's the 4th time so far. This week's theme is "tiki". Tikis are stone or wood totems carved by the Polynesians. And the tiki culture developed itself a lot in the past decades, on the extended theme of Tahiti, Polynesia, Hawaii, islands, tropics, pirates etc. The central point of the tiki culture remains the tiki bar of course. :-) So instead of drawing totems, I decided to draw parrots from Hawaii standing on a Plumeria tree. The plumeria flower is so beautiful! It is often found on Hawaiian patterns, along with hibiscus flowers. 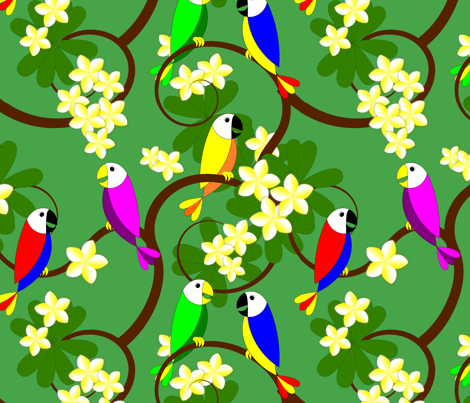 If you like my parrots and plumeria pattern, please vote for it! To vote, click on the image to get to the contest page, then select the patterns you like, and click on "Save my votes" at the bottom of the last page. If you do not see the online coloring page Spoonflower contest - Tiki in black and white above, you need to use another web browser: see the page Supported Browsers. Put a lot of leaf 's and then we love it.